This book changed the way I think of my days. It caused me to re-evaluate what is essential in my life. If you feel like your day is constantly go-go-go, then you will enjoy this book. It’s great common sense that is easy to apply in your day to day life. 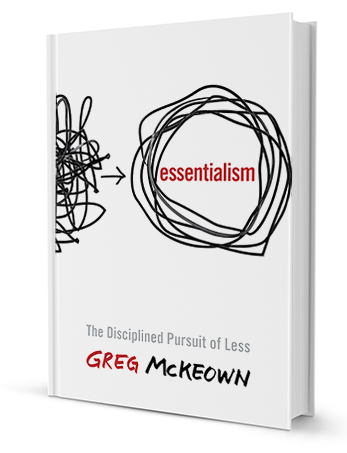 Greg McKeown breaks the book into 4 parts: Essence, Explore, Eliminate, and Execute. My favorite is in Eliminate and discusses the power of a graceful “no.” It’s a lesson that I’m incorporating as I am learning not to overextend myself . In today’s world, it’s so easy to say “yes” to everything. No wonder most of us feel overwhelmed, unproductive, etc. Learning to say “no” creates more space and allows for more focus on the purpose. Friendly warning: my colleague, Shelby, says she read this book in 2 days – she enjoyed it that much. Enjoy! The #1 point that STUCK : The word priority came into our language in 1400’s. It was singular……500 years later we pluralized the term. Why do we think we can have multiple priorities. Other memorable mentions – “Uncommit” Win big by cutting your losses. “Clarify” One decision that makes a thousand. “Edit” The Invisible Art. Love the blog. Great idea.